Whether or not your chickens experience cold stress in winter depends on a number of factors, including how rapidly the temperature drops, how cold it gets, how long it stays cold and the chickens’ ability to stay dry and out of the wind. A well-feathered bird can be perfectly comfortable at an air temperature of 50°F in still air and sunshine, while the same bird left out in the wind and rain will be miserable at 68°F. One of the most important environmental factors inside a coop in cold weather is humidity. Although relative humidity tends to be low in winter months, the air inside a chicken coop is typically high in humidity from breathing and pooping. If the air trapped under a chicken’s feathers becomes damp, the chicken’s body needs to generate more heat energy so the chicken won’t feel a chill. 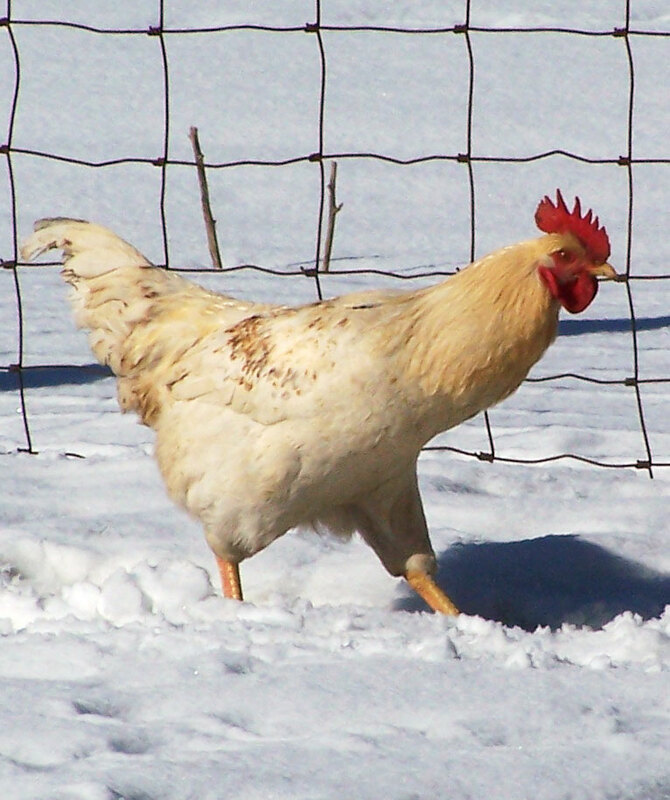 Temperatures low enough to freeze moisture in the air can also freeze combs, wattles, and toes. Frostbite is therefore more likely to occur in damp housing than in dry housing. To help reduce coop humidity during winter, avoid confining chickens indoors during the day. As long as they can get back in when they want to, and provided they can find resting places away from direct wind, they may prefer to be outdoors despite the cold. They will likely seek a protected nook where they can enjoy the sun’s warming rays. Ventilation helps reduce a coop’s humidity. If moisture accumulates on coop windows, ventilation is inadequate. Ventilation involves a steady air exchange whereby stale air goes out and fresh air comes in. To ensure good ventilation without draftiness, arrange windows and air vents higher than the chickens’ roost. Good ventilation is not the same as draftiness. In order to stay warm, a chicken needs protection from drafts that carry away warm air trapped in its ruffled feathers. To determine if your coop is drafty, hold out a strip of survey tape or tissue paper in the roosting area. If the tape or paper moves while you hold it still, the coop is too drafty. When coop humidity is controlled, installing a heater is not the best idea, unless the temperature drops so far so fast your chickens don’t have time to acclimate. Routinely using a heater interferes with the chickens’ ability to gradually acclimate to the cold. And many heaters used in chicken coops pose a serious fire hazard. The safest type of heater to use in a cold-weather emergency is a flat-panel radiant space heater hung from the ceiling or affixed to the wall. In most cases, the only heat source your chickens will benefit from is a base heater that keeps their drinking water from freezing. An alternative is to fill drinkers with warm water several times a day to ensure your chickens get their fill. As long as your chickens get enough to drink, they will generally eat enough to meet their cold weather nutritional needs. Chickens that have adequate feed, plenty of drinking water and housing that is neither damp nor drafty, are less apt to suffer in cold weather. Great arlicte. This is very informative, bookmarked. Thank you again for writing.